Introducing our all-new Kawasaki Teryx Windshield! Fits ANY Kawasaki Teryx 4, and ALSO will fit ANY Kawasaki Teryx 800 machines, 2014 and later- model years! 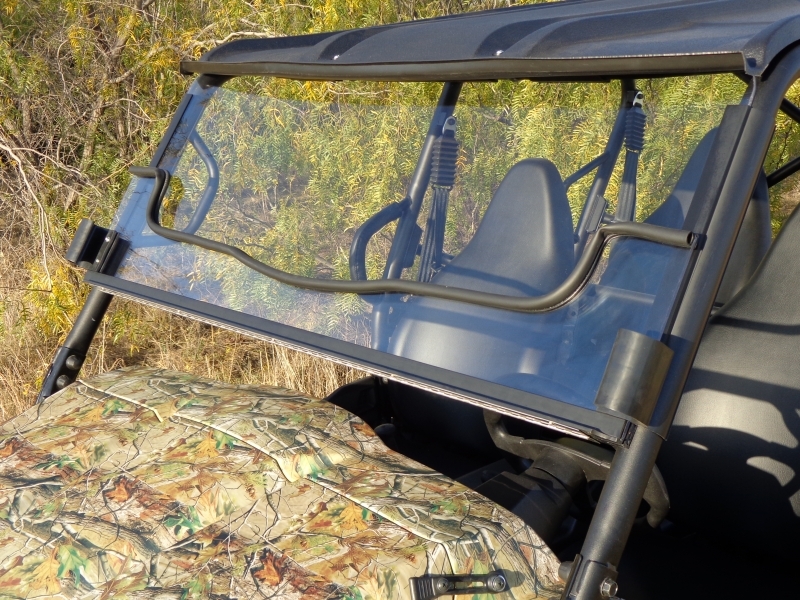 Split / Hinged Design: allows the best of both worlds…Leave the windshield closed in bad/cold weather, and leave the windshield opened during the warmer months! Kawasaki offers only the options of a full fixed windshield, or a half windshield. Our patent-pending design does BOTH! Based upon the exact same design and materials, as our top-selling 3000, 4000, and 600-Series Mule windshields. Thousands of those units are in service across the globe, being used from everyday UTV owners to the US Military. 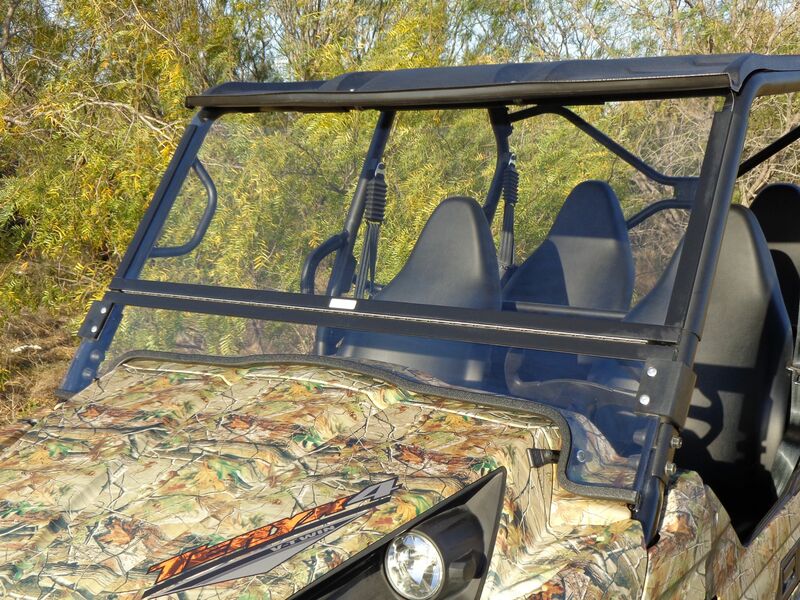 This Teryx windshield is certain to be just as popular. Acrylic & Polycarbonate construction, with a stainless steel hinge aircraft-riveted to the center section. Our windshields are highly-proven, and are built to last. We sell thousands of units per year. With this being said, our quality is top-notch! Our windshields do not fail and/or fall apart. Works flawlessly (no modification required) with the optional Kawasaki plastic Teryx top. Yes, you CAN trailer the machine with our windshield installed. As long as the Teryx is facing forward on your trailer, and as long as the lower section is raised into the open position, you can pull the machine behind your vehicle on a trailer. 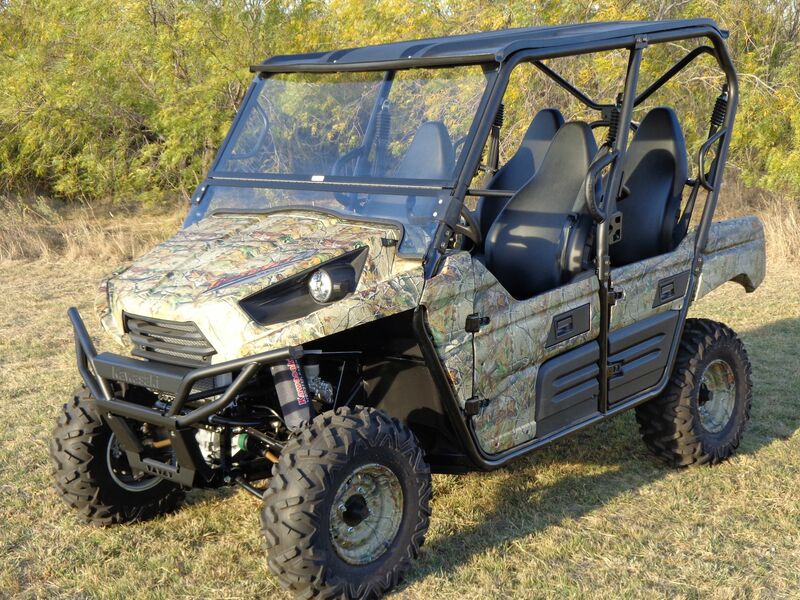 Our Teryx windshield is designed to fit on ALL Teryx4 machines, as well as the 2014 (and later) Kawasaki Teryx 800 machines (two-seat OR four-seat). We do not sell ‘universally fitting’ windshields, like you may see advertised. Our windshield is computer-designed to specifically fit these machines, perfectly. NO TOOLS NEEDED! Installs in a few minutes, with absolutely no tools required! Dealers, please call us today for immediate shipment! Interested retail customers, please call us too! We will gladly direct you to one of our authorized dealers around the country.